Add to My Favorite Store. 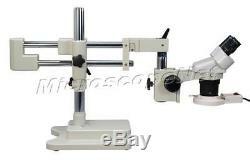 Dual-Bar Boom Stand 20x40x80x Binocular Stereo Microscope. With 8W Fluorescent Ring Light. Widefield eyepieces WF10X/20 and WF20X/10. Dual-bar Sturdy boom stand secure scope body and allows large free space for operation. Bright and shadowless 8W fluorescent ring light with 48mm thread adapter. Plug and see, no special knowledge needed. High quality optical glass elements. Sturdy boom stand provide extra working space and secure microscope head. Bright fluorescent light with 48mm thread adapter. Reflecting housing provides bright illumination. Product GS and CE approved. Sharp stereo erect images over a super wide field view. Left ocular-tube diopter adjustment ±5dp. Interpupillary distance: 2-3/16" 2-15/16"(5575mm). Adjustable inter-pupillary distance to fit anyone's eyes. Locked-in eyepieces avoid eyepiece dropping. Capable to add auxiliary lenses and ring lights. M ounting size of auxiliary lens and ring lights: 48mm female thread. Eyepieces: wide field WF10X/20 and WF20X/10. Objectives: rotational 2x & 4x. Three magnification levels: 20x, 40x & 80x. Long working distance: 3 (75mm). Metal rack and pinion mechanism. Dual horizontal bars allow large working area and secure microscope body. Body holder can be horizontally pan rotating. Matching diameter for microscope body: 75-76mm. Body holder can flip up to 90°. Boom stand length: 27 (68.5cm). Height of boom stand: 163/4 (42.5cm). Boom horizontal travel stroke: 8-5/8 (22cm). Boom vertical travel stroke: 10-7/8 (27.5cm). Diameter of boom bar: 1-1/4 (3.2cm). Base Dimension: 10-1/4"x 8-1/4" (26cm x 21cm). Base height: 2-3/16 (5.5cm). C olor temperature of fluorescent light : 6500K. Power: 8w 110v (USA and Canada). Dimension: 19-5/8 " x 18-1/2" x 14-1/2 (50cm x 47cm x 36cm). A pair of WF10X/20 eyepieces. A pair of WF20X/10 eyepieces. A pair of rubber eyeshields. Fluorescent ring light set with power adapter. A full set of universal boom stand with rack and pinion focus adjustment (A902). Gooseneck fiber cold light for flexible lighting angles. Fiber ring light with low heat and adjustable intensity. Gem jewel tweezers (be used on a mechanical stage). 0.5X auxiliary objective for increasing working distance and field of view. 2.0X auxiliary objective for having higher power levels. USB camera eyepiece for computer connection. Mechanical specimen stage for smooth movement. C olor temperature of Fluorescent ring light tube : 5000K and 7800K. A: We are happy to leave feedback for our customers once we have been paid and the item has been delivered to the carrier. We would appreciate that once you receive your item, you also leave us feedback. The item "Binocular Stereo Microscope 20X-40X-80X Boom Stand w 8W Ring Light" is in sale since Tuesday, August 09, 2016. This item is in the category "Business & Industrial\Manufacturing & Metalworking\Semiconductor & PCB Equipment\Inspection Equipment".